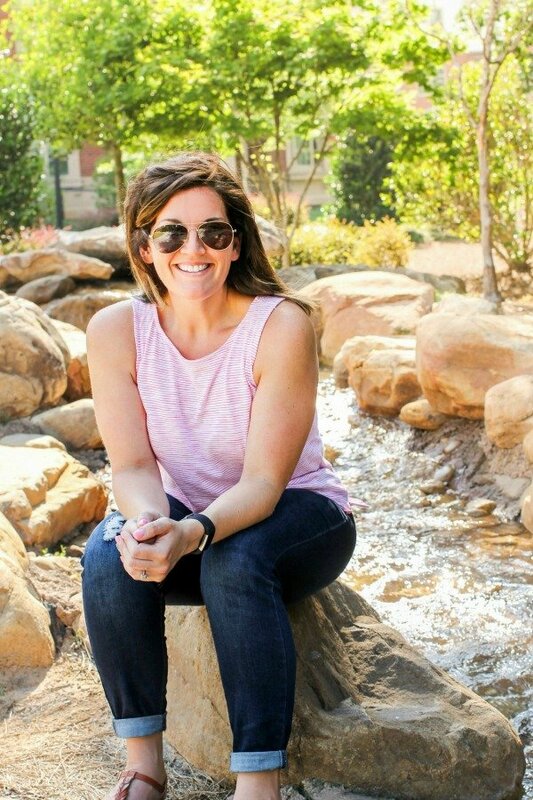 October 3, 2018 By Allyson 20 Comments This post may contain affiliate links. Read my disclosure policy. Making baked potatoes has never been easier! The Instant Pot is such a dream machine, that you can pretty much make anything in just a fraction of the time. 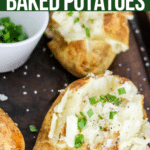 These Instant Pot Baked Potatoes were creamier in that any potatoes I’ve even made in the oven or microwave, and just were so delicious! Pop them under the broiler for a few minutes when they are done, and you even have traditional crispy skin without any of the hassle of baking! Serve these potatoes with delicious Crispy Coconut Chicken Strips, Easy Meatball Sliders, or Walnut Honey Chicken Strips! Like Sweet Potatoes better? Find the INSTANT POT SWEET POTATO DIRECTIONS HERE! How about Loaded Mashed Potatoes as well! Don’t have an Instant Pot? You need to buy one now!! They are life changing because they save so much time and effort!!! I recommend the 6 quart Instant Pot if you have 2-4 people in your family, but if you have more than 4 people, I’d recommend the 8 quart Instant Pot. You can make typical slow cooker recipes in a fraction of the time and so many staples in no time! 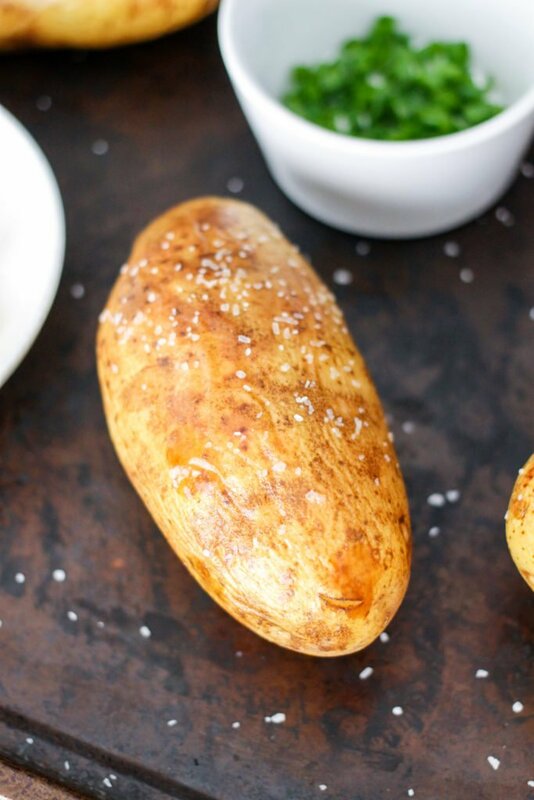 You want to use medium sized russet potatoes for Instant Pot Baked Potatoes. The cooking time will depend on how big the potatoes are, so try to get potatoes all about the same size. Clean your potatoes! Make sure you scrub the dirt off the skins of the potatoes before cooking. Stab some holes in the potatoes with a fork. Add a cup of water to the bottom of the Instant Pot. 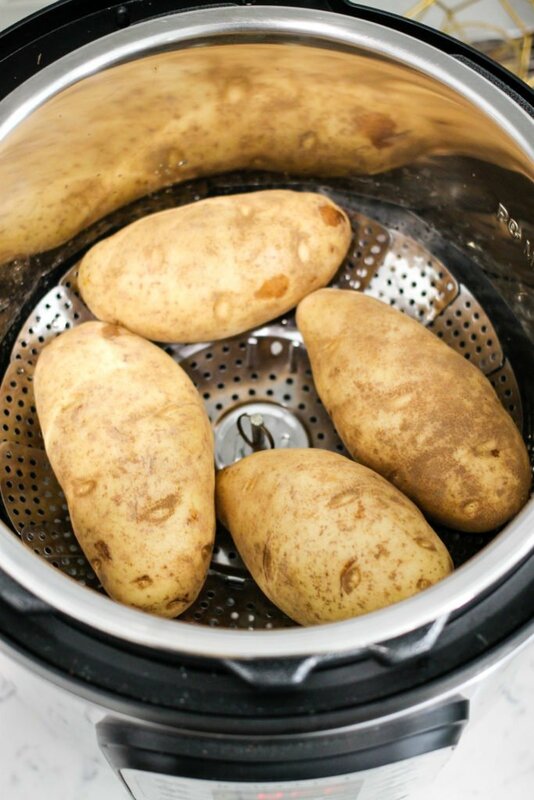 Place the steamer rack in the bottom of the pot – you do not want the potatoes touching the water or they’ll get soggy. You can add as many potatoes as you want! Set the pressure to high/manual, and cook for 13 minutes (time will vary based off size) for medium sized potatoes. You should remember when using the Instant Pot, that the time it takes to cook the recipe (13 mins), is not the total time of the recipe. You need to give the pot some time to ‘come to pressure’. Once the time is up, let the pressure release naturally (don’t flip the valve) for 7 minutes. Then release the rest of the pressure. Optional: If you want crispy skins on your potatoes, place them on a baking sheet and spray lightly with oil and sprinkle some salt on the skins. Place under the oven broiler for 3-5 minutes, keeping a close eye on them so they don’t burn. I love broiling them because I love eating the crispy skins! 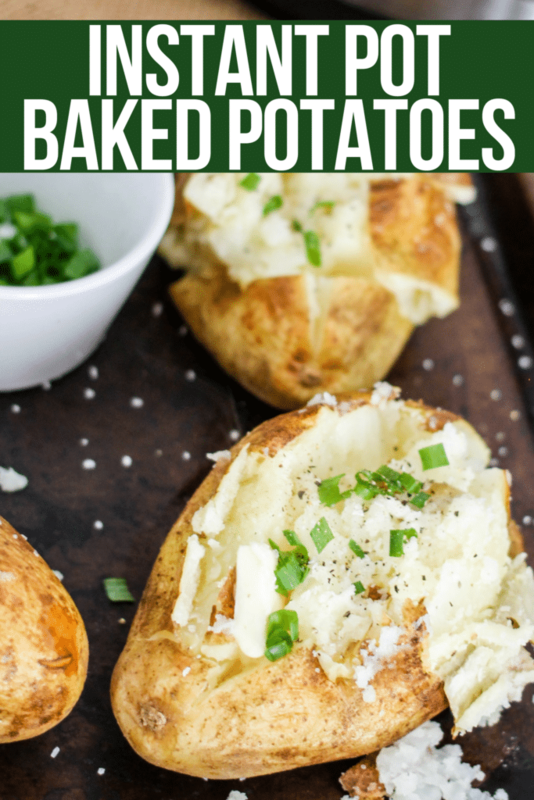 Serve the Instant Pot Baked Potatoes with your favorite toppings such as butter, chives, salt, pepper, sour cream, and cheese! YES! Potatoes are super healthy, but you have to be careful about what you add to the top of the potatoes! Potatoes are an excellent source of vitamin C, a good source of potassium (more than a banana! ), a good source of vitamin B6, and fat, sodium, and cholesterol-free! While they do have a lot of carbs (about 26g for a medium/small potato), they are great for energy! 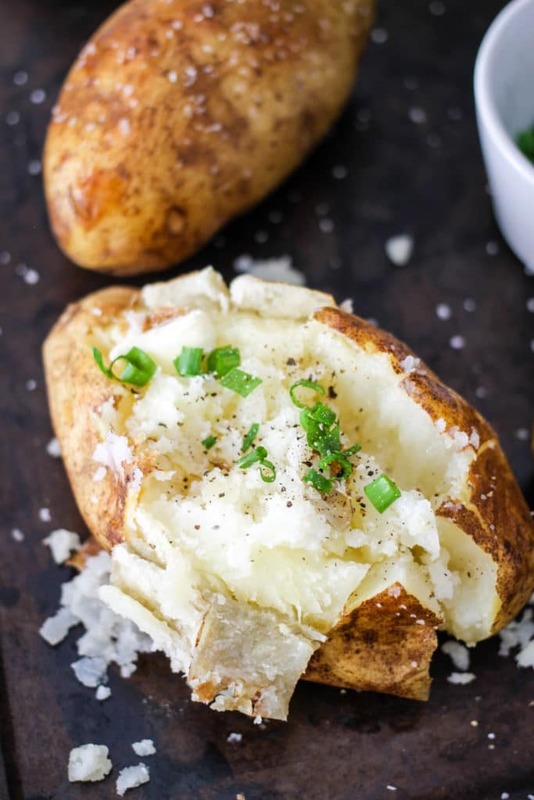 A small/medium instant pot baked potato contains about 165 calories. This doesn’t count any toppings! Sweet Potatoes are also SUPER healthy! Checkout how to make them in the Instant Pot HERE! Top the baked potato with buffalo cheese sauce and broccoli for the Ultimate Buffalo Broccoli Cheese Stuffed Baked potato! Make a delicious Indian inspired baked potato with these Samosa Stuffed Baked Potatoes. Top with traditional butter, salt, pepper, chives, and sour cream (or Greek yogurt for a healthier option). Top with broccoli and shredded cheddar cheese. Top with avocado, crispy bacon, and cheddar cheese. Make homemade basil pesto (or store bought) and add to the top of the potato along with some parmesan cheese. Instant Pot Roasted Garlic Hummus has only a handful of ingredients and is so delicious! Save money and know exactly what’s in your food with this recipe! Pumpkin Puree from scratch using the Instant Pot is so easy! Use homemade pumpkin puree in all your favorite fall recipes! Instant Pot Peanut Butter Cheesecake is a stunning dessert that comes together in no time! Not only is it amazingly easy, but it’s the best cheesecake EVER! Instant Pot Mac and Cheese takes hardly any time to cook, is majorly creamy and delicious, and will become your go-to mac and cheese recipe! Instant Pot Corn on the Cob is ready to eat in just minutes and is super flavorful! No need to peel the husk; corn on the cob can be cooked directly in the husk and then removed without a mess! Clean the potatoes, removing any dirt from the skin. Poke each potato about 5 times with a fork. *Set oven on broil setting. Place potatoes on a baking sheet, and lightly spray with olive oil and sprinkle with salt. Place in oven. Cook about 3-5 minutes, or until skin has desired crispness. Carefully remove, and serve with desired toppings. Potato cooking time will vary depending on size. Try to find potatoes that are all around the same size (6 ounces/medium). If potatoes are larger, add a few more minutes to cooking time. If potatoes are smaller, reduce time a few minutes. One reason I haven’t tried baked potatoes in my Instant Pot is because I love the crispy skins. I love your tip about broiling the potatoes after they cook. Genius! Still saves so much time doing it that way and they turn out deliciously crispy! Mmm! Such a perfect dinner in the wintertime! Thanks so much! I am so glad you shared this! I needed a good instant pot baked potato recipe! So delicious!! And the perfect side dish for any meal! 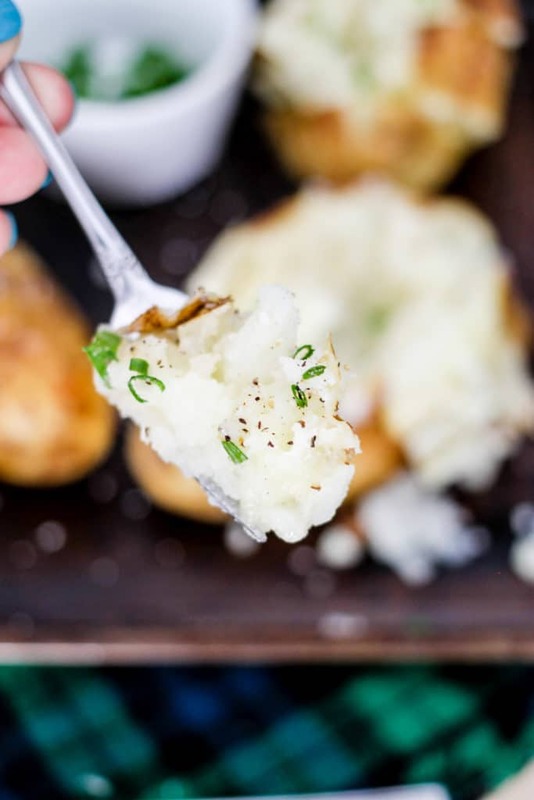 Love this easy way to make baked potatoes fast – so genius! Thank you so much for sharing this a huge time saver! I want to try this potato immediately! Looks beautiful and tasty! This recipe looks incredible! Thank you. I love crispy skins! These look really good! So easy and delicious! Perfect for busy weeknights! These look like perfection! I can’t wait to try them! YUM!! Mine are coming out perfect but they’re exploding? I’m pricking them but they are coming out exploded. Help?!? Oh no! That is weird…they are cooked perfectly? How big are the potatoes? Maybe decrease the time to 12 mins…How many times did you prick? I have to try this out! Great side dish to any dinner! This is my first time cooking with an Instant Pot. I baked two lpotatoesto experiment. They were undercooked. What did I do wrong? Thanks. I can’t be sure since I am not there, but I would guess the potatoes were bigger. I would add a minute or 2 if the potatoes are larger in size. Perfect baked potatoes. I was in a hurry so I skipped the broiling step. I used smal-Medium potatoes and they were JUST cooked. I might want to add 1-2 minutes to cook time in the future. This is so great! Glad you loved them! So glad you loved them! You can definitely add another minute if you want them super soft, or if they are on the larger side. It’s VERY dependant on size of the potato and shape!